The Copyright Law of the People’s Republic of China was adopted in September 1990 and came into effect as of June 1st, 1991. After its second amendment in October 2001, China decided to make a partial amendment in February 2010 in order to further improve China's copyright law system and to meet the practical needs for the implementation of the WTO’s award on China-US intellectual property dispute, the amended Copyright Law went into effect as of April 1st, 2010. Drafting of the third amendment started on July 13th, 2011. The first draft revision was officially released to solicit public opinions on March 31st, 2012. After receiving more than 1,600 comments and feedback The National Copyright Administration of China (NCAC) released the second draft revision on July 6th and requested further feedback. They received 217 from more than 100 units and persons. In comparison with the previous three draft revisions, the third draft revision featured great changes in structure, general enlargement in the content of rights and obligations, obvious adjustment in authorization mechanism and trading patterns, and a significant improvement in copyright protection. Many people in the copyright industry have actively expressed their observations on and suggestions for the three revisions, which witnessed public argument on some of the hot issues such as the extending management of collective management organization, online copyright protection, the right of pursuit to fine arts, the rental right of performers, the right to secondary remuneration etc. It is of great significance to amend the Copyright Law for the third time because this is an active amendment which is different from the previous three passive ones. Based on China’s actual development, the third amendment embraces the consensus among the industry and the public, and makes a positive response to the concerns and requests of the relevant interested parties. Furthermore, the third revision becomes more consistent with the relevant international rules, and stipulates a solution with high operability to prominent problems, which has perplexed China’s current copyright legal system for a long time. The Trademark Law of the People’s Republic of China, the first special law for the governance of IP industry in China, was promulgated on August 23rd, 1982, and turned a new leaf for the booming development of China’s trademark industry. The past three decades after its promulgation has witnessed many achievements in trademark law in China. Statistics shows that China has led the world in trademark development because there have been 10.54 million applications for trademark, 7.17 million trademarks being accepted and registered, and 6.09 million registered trademarks being used in China. Officer of the State Administration for Industry and Commerce (SAIC) once said on the 2012 China Trademark Annual Conference that China is not a dominant country in trademark although it has been the number one in the world in quantity. Therefore, SAIC will continue to improve China’s trademark legal system and carry out the strategy for the development of China’s trademark in order to transform China’s focus on quantity into a dominant country focused on quality in terms of trademark industry by the beginning of 2020. The Trademark Law was amended in February 1993 and October 2001 and its third amendment was launched by SAIC in 2003. The third amendment focuses on three aspects with great concerns of the industry. The first is to provide convenience for registered trademark applicants. The second is to further safeguard fair competition market order and to curb unfair competition such as malicious trademark rush-register and free-riding of famous trademark. It is expected that provisions will be added for the prohibition of malicious rush-register of early registered and used trademarks, and for the prevention of using registered trademark as business names in order to stop the frequent free-riding of famous trademark. The third is to introduce a more severe administrative penalty on trademark infringement. The patent law is a basic guarantee for the healthy development of patent system in any country. The Patent Law of the People’s Republic of China was promulgated in 1984 and amended in 1992, 2000 and 2008. China’s State Council decided to amend the Patent Law in 2012 in order to promote economic and social development and to improve the capability of independent innovation in China. SIPO released the Patent Law of the People’s Republic of China (draft for comment) in August 2012 after investigations and researches. In January 2012, Blackcow Food Co., Ltd. brought Sichuan Jule Food Co., Ltd. to court. The two parties debated over whether or not “Black Milk” should be considered a generic name. After trial, the Guangdong Higher People’s Court concluded that the defendant failed to provide sufficient evidences to prove that “Black Milk” is a generic name rather than a trademark. Therefore, the defendant’s trademark was declared similar to that of the plaintiff’s and its usage an infringement on the plaintiff’s trademark right. In 2009, Ashland found that a former employee who had participated in the establishment of an industrial additives company was suspected of applying Ashland’s patented technology and trade secrets to manufacture a series of products similar to Ashland’s K series. Ashland claimed this caused significant economic damage to Ashland’s Beijing subsidiary and launched lawsuits with the Suzhou Intermediate People’s Court and the Beijing No.1 Intermediate People’s Court over patent infringement and trade secret infringement, respectively. On January 18th, 2012, Ashland and the defendant company settled both cases. The defendant promised to respect the IP of Ashland, ceased using the patents and trade secrets in any future chemical manufacturing processes, and paid the plaintiff 22 million yuan with costs. This marks by far the highest compensation paid in any IP infringing lawsuits filed by a foreign company in China in the chemical production industry. On February 23rd, the well-known NBA basketball player Michael Jordan sued Qiaodan Sports in China, claiming that Qiaodan the (Chinese translation of Jordan) uses his name “deliberately and recklessly” without his authorization. It is a typical example of third-parties registering to use celebrities’ names as trademarks. In 2012, similar cases included Jeremy Shu-How Lin, Liu Xiang, Mo Yan, etc. According to the statistics of the Beijing First Intermediate People’s Court, its volume of administrative cases filed concerning trademarks rose rapidly from 19 in 2002 to 2,043 in 2011, which means an increase of nearly 110 times over the last decade. Among these cases, a large quantity were caused by rush registrations in bad faith. On February 25th, the Oriental IP Club (OIPC), which was formed by 13 IP insiders departments of Chinese and foreign enterprises, professors from Shanghai University and Tongji University, as well as media representatives from China IP magazine and Mysipo.com. from Shanghai, was formally established. In March, the State Intellectual Property Office (SIPO) gave permission to Chongqing to set up the “National Cloud Computing IP Pilot Site (Chongqing)”. Chongqing will build a regional patent information service center through cloud computing with the aim of carrying out patent transactions through a “patent cloud” in China. In order to unify the brand image of Guangzhou traditional brands and souvenirs, in March, the Guangzhou Traditional Brands Association designed and confirmed the unified logos for “Guangzhou Traditional Brands” and “Ten Finest Guangzhou Souvenirs”, registered the copyright and applied for trademark protection. It further stated that a “Guangzhou Traditional Brands List” covering 100 brands will be compiled in two years. The Intellectual Property Board of the organizing committee of the World Watch and Jewelry Show in Basel, Switzerland, ruled over the complaint filed by Swiss watchmaker Omega against Tianjin Seagull Watch Group over trademark infringement on March 10th, finding that the signboard used by Seagull during the Show constituted no infringement over the registered trademark of Omega. On March 28th, 2012, during a press conference jointly held by Guangdong Dongpeng Ceramics Co., Ltd. and Guangdong Jiajun Ceramics Co., Ltd., the two companies announced that their travertine patent dispute, which started in 2008, was settled. The two parties agreed to jointly safeguard and share the travertine patent right. In their Joint Statement, the two companies promised to respect each other’s IP rights, to form a multi-channel alliance involving issues such as cross-licensing and exchange technical support, and to jointly uphold their shared IP rights if needed. On March 28th, the Michelin v. Cenchelyn case over trademark infringement, unfair competition and enterprise’s name right infringement was heard by the Chongqing No.5 Intermediate People’s Court. The defendant argued that its trademark “Landsail” was significantly different from the plaintiff’s registered trademark “Michelin” and its corresponding Chinese translation “米其林”. Meanwhile, it also argued that its commercial brand “Cenchelyn” and its Chinese translation “森麒麟轮 胎”, as well as the packaging of the products were also greatly different from the logo and packaging of the plaintiff. At the end of 2010, Nokia sued Shanghai Huaqin Telecom Technology Limited Company (Huaqin), claiming that the latter infringed upon eight of Nokia’s patents, and therefore should pay Nokia 90 million yuan in compensation. Lawyer’s letters concerning this case were sent to nearly 20 mobile phone manufacturers. Since the disputed patents covered basic component parts which were found pervasively in products throughout the communications industry, the results of the case were expected to have a significant impact on China’s domestic mobile phone industry. Soon afterwards, Huaqin filed applications with the Patent Reexamination Board of SIPO, seeking to invalidate Nokia’s patents. In April 2012, the Board nullified three Nokia patents. Nokia then withdrew the lawsuit. On April 10th, the Wenzhou Intermediate People’s Court delivered its first instance decision in the “Castel ” trademark case, ruling that the infringers—a French wine manufacturer Castel Group and its Chinese distributor— should cease infringing activities immediately, publish statements in newspapers and pay compensation totaling 33.73 million yuan for the economic loss of the plaintiffs Panati Wine (Shanghai) Co., Ltd and Li Daozhi. At trial, the court found that the Castel Group was fully aware of the legal existence of the “Castel” mark in China when it entered into a sales agreement with the Shenzhen company. Therefore, exporting wines with infringing labels to China constituted trademark infringement. In April, semiconductor chip giant Intel launched a lawsuit against Shenzhen Inteljet Digital Technology Co., Ltd. and its dealers, holding that the printing-supplies produced by the defendant under the “Inteljet” trademark had infringed upon the “Intel” trademark right. The alleged infringing products included toner cartridges and ink cartridges. The Shanghai No. 2 Intermediate People’s Court first instance ruled that the defendant’s conduct constituted trademark infringement ordered them to cease all infringing activities immediately and pay the plaintiff 400,000 yuan in compensation. On April 11th, the Bloomberg L.P. v. Dazhihui Co. Ltd. case involving unfair competition was heard by the Shanghai No. 1 Intermediate People’s Court. Bloomberg argued that Dazhihui had infringed upon its packaging and decoration right. It requested that the court order Dazhihui to eliminate the ill effects of infringement, make due apologies and pay five million yuan in compensation. In January 2013, Dazhihui made changes on the alleged infringing packaging. Bloomberg then withdrew the lawsuit. On April 17th, actor Feng Yuanzheng and his wife, actress Liang Danni, sued the National Ballet of China (NBC) on behalf of writer Liang Xin, claiming that its ballet The Red Detachment infringed upon the copyright of the Liang Xin’s drama with the same name. They are seeking a public apology and compensation of 550,000 yuan. In early May 2011, sport products manufacturer Descente, Ltd. filed a lawsuit with the Beijing No. 2 Intermediate People’s Court, claiming that the online group selling of the “Le Coq Sportif” branded shoes organized by “Di Da Tuan” and “Zou Xiu.net” infringed its trademark right in China. On April 25th, 2012, after one year’s testimony and trial, Descente won the first instance of the case. It is the first online group purchase case resolved by legal procedures in China. On April 25th, the Sixth International Conference on the Intellectual Property Protection of High Technology was held in Beijing. Industrial design protection of the graphical user interfaces of electronic products was the focus of attention during the conference. In April, the Beijing office of the Intellectual Property Rights Department of the Italian Trade Commission (ITC) submitted a total of 30 brands to SIPO in three successive cases, claiming that these brands falsely advertised their products as having Italian origin to lure customers. The alleged fake Italian brands cover many categories of products, including bags and suitcases, leather products, textiles, furniture, automobile accessories. Among the defendant brands, some are well-known in China, such as “Mark Fairwhale” and “Larento”. The No.1 trademark case in China—the Guangzhou Pharmaceutical Holding Ltd. (GPH) vs. Hong Kong Jiaduobao Group (JDB) case over the Wong Lo Kat Herbal Tea (WLK) trademark, which is valued at over 108 billion yuan, came to an end on May 9th. The China International Economic and Trade Arbitration Commission ruled in favor of GPH. GPH thus retrieved the rights of producing and managing the red-canned and redbottled WLK. In May, SIPO delivered the Announcement on Issues Concerning the 2012 Qualification Examinations of Patent Attorneys in China. The Announcement declared and explained the major adjustments made to the examination. Some significant changes include relaxing the requirements for exam applicants, giving applicants an earlier date to sign up for the exam, setting new rules for educational certification and facilitating the registration procedure for examinees from Hong Kong and Macau to qualify to take the exam. Believing that the devices of the “Dierlafu and devices” trademark applied by the accessory shop “Dierlafu” were similar to its trademark “Kappa and devices”, ACHILLES SPORTS PTE.LTD. filed an objection against the registration of the “Dierlafu and devices” trademark. However, the Trademark Office rejected Achilles’ objections on Class 9 and Class 26 respectively, and ratified the registration of the “Dierlafu and devices” trademark. On June 26th, the Diplomatic Conference on the Protection of Audiovisual Performances was concluded in Beijing with the signing ceremony of the Beijing Treaty on Audiovisual Performances (Beijing Treaty). The new treaty for the first time brought all inclusive rights protection for audiovisual performers into the framework of international copyright protection. The conclusion of the Beijing Treaty is a landmark moment in improving the international copyright protection system for audiovisual performances, boosting the healthy development and prosperity of the world’s cultural industry and accelerating the development of folklore performances in developing countries, including China. Haday, one of China’s most well-known soy sauce manufacturers, has a type of soy sauce product with the trademark “Weiji”. The defendant also has a soy sauce of the same name. Therefore, Haday claims the defendant has infringed upon its trademark right and its actions constitute unfair competition. Haday is requesting that the court grant its motion requiring that the defendant stop all infringing activities, compensate Haday 10 million yuan, apologize and eliminate the negative influence caused by the infringement. Cartier S.A. (Cartier) has recently filed two lawsuits in the Pudong New Area District People’s Court over trademark infringement and unfair competition. The defendant, Shanghai Yishiduo E-commerce Co., Ltd. (Yishiduo) who operates the online shopping site Yihaodian.com, is accused of selling fake Cartier products online. Cartier stated that Yihaodian.com has used the same trademark with Cartier in promotion with ads products with the “classic design of Cartier” or Cartier related words. Based on these facts, Cartier filed a lawsuit seeking a court order the defendant to cease the infringement and unfair competition activities. Cartier also seeks a court order requiring Yishiduo to clarify in newspapers and on its website that there is no connection between the two products to undo any influence the infringing claims may have had on potential consumers. Moreover, the plaintiff claims compensation for economic losses of 500,000 yuan and for reasonable losses of 50,000 yuan. In July 2011, over 20 Chinese writers formed a union to uphold their rights and filed litigation against Apple for copyright infringement. On December 27th, the court ruled in favor of the plaintiffs, required Apple to pay a total of 1.03 million yuan in compensatory damages for the right holders’ economic losses. In 2012, Apple was brought to court for copyright disputes several time. Companies such as the Encyclopedia of China Publishing House and Chineseall.com, the 20 writers and others have all accused Apple for selling infringing contents in its AppStore. In July, after two long years, the iPad trademark case between Apple and Proview finally settled. Apple paid Proview 60 million dollars, thereby resolving all disputes concerning the “iPad” trademark at one time. WIPO launched the 2012 Global Innovation Index (GII) in Geneva on July 3rd. According to the report, Switzerland, Sweden, and Singapore, just as last year, remain the top three countries on the Index. Hong Kong and Mainland China ranked 8th and 34th respectively. China was on the top of the Global Innovation Efficiency Index list. On July 4th, the NCA, Ministry of Public Security, Ministry of Industry and Information Technology, and China Internet Information Center jointly held a press conference in Beijing, declaring the beginning of a nationwide campaign against copyright infringement on the Internet, which it then carried out from July to November. Apart from illegally providing music, videos and books in digital form without authorization, the online trade of pirated software, books and audio-visual products were also the main targets of the campaign. In July 2012, after five years of disputes, the tea merchants and manufacturers of the Wuyi Mountain finally reached consensus over the resolution of the “Jin Jun Mei” trademark. They agreed that the “Jin Jun Mei” trademark should firstly be registered by Yuanzheng Company and then authorized to the Guild of the Tea Industry. Thereafter, the Guild should license the trademark to other tea merchants and companies. In August, the Hangzhou Intermediate People’s Court of Zhejiang Province ruled over a trademark right and packaging right infringement case. The defendants, Yantai Aowei and Yantai Chivas, which were the manufacturer and dealer of the Ailishe Chivas (a counterfeit of Chivas 12) were found guilty of infringing upon Chivas Brothers’ IP rights. The court therefore ordered the defendants to pay Chivas Brothers half a million yuan in compensation. At the signing ceremony of the Hubei Patent Pledge Financing Project in Wuhan, Global Emission Management Co., Ltd. (GEM) from Jinmen City pledged 39 patents in exchange for a loan of 300 million yuan provided by the Hubei branch of the China Development Bank. The amount of the loan set a new record for a single patent pledge agreement of an individual enterprise nationwide. In August, Shanghai Ctrip Business Co., Ltd. was taken to court for infringement of the advertisement keywords, “Portable Flight Information,” “9588” and “9588.com,” from its competitor Shangtong Aviation Service (Beijing) Co., Ltd. Ctrip was prosecuted for infringement on trademark and unfair competition. It has been reported that Ctrip proposed some terms of settlement, which were declined in the end. In August, Ma Mingbo and Xiao Yao, the writers of book A Bite of China , brought suit against CCTV, Guangming Daily Press and Beijing Fonghong Media over plagiarism. The plaintiffs allege that the book was written and compiled in 2006 and the contents and compilation were then plagiarized by the media defendants above. The Beijing Dongcheng District Court accepted the case. The trademark application of “National Liquor Moutai” filed by Guizhou Moutai has passed the preliminary examination of China’s Trademark Office, which caused uproar in the industry. By August, Shanxi Fenjiu Group, Hebei Hengshui Laobaigan Liquor-making (Group) Co., Ltd., Guizhou Renhuai Nanguo Liquor-making Group, Century Law Firm, Chengdu Lijiu IP Agency, Jingxi Ruian Design Company and a Chongqing consulting company had all filed objections against the registration of the “National Liquor Moutai” trademark. On September 6th, one hundred writers of the Shanda Literature released a joint statement which appealed to search engines such as Baidu, 360, Sogou and SoSo to take actions to boycott infringing search results, which received positive responses. In September, “Australian Made” and “Australian Grown” (AMAG) have been registered as trademarks in China. Therefore, exporters in Australia can ensure that products with such trademarks as well as the trademarks themselves will not be counterfeited. After serious review by the committee, State Intellectual Property Office (SIPO) announced the list of 2012 national patent information leading and teaching talent in September, which narrowed down 33 people as national patent information leading talents and were selected as a part in National Patent Information Experts Library. In addition, 100 people were chosen as national teaching talents and included as a part in National Patent Information Teaching Resource Library. On September 25th, the Beijing Intellectual Property Office along with the Beijing Municipal Education Commission released the ranking of the total volume of patents of universities located in Beijing. During the year of 2009 to 2011, the top three of the ranking are: Tsinghua University with 1,134 patents, Beijing University of Aeronautics and Astronautics with 639 patents, Beijing University of Technology with 327. In September, the registration of “Collagen CCOL2A1 Full-length Gene and Its Use,” invented by the Director of Immunology Department of PLA 307 Hospital Xi Yongzhi, was approved. Therefore it becomes the first European gene patent in China, which is internationally recognized and of great medical value. In October, license for the “Yangcheng Lake” trademark, which has been used continuously by Yangcheng Lake Co., Ltd. over the famous “Yangcheng Lake crabs” for 10 years, expired. Consequently, the company’s IPO becomes far more distant than expected. In October, headquarters of the Chinese Sports Newspaper, which is exclusively licensed to reproduce and distribute the ninth set of Radio Gymnastics by the General Administration of Sports, filed suit against several other radio gymnastics publishers, media companies and bookstores. The first instance verdict decided that the body movement, overall arrangement and “watchcry” in the Ninth Radio Gymnastics were not legally qualified as a protected piece of work. As a result, they could not enjoy copyright protection. In October, the Beijing No.1 Intermediate People’s Court made the final adjudication on the criminal case of infringement on Daoxiangcun trademark, upholding the first instance verdict issued by the Beijing Changping District Court. The two defendants, Zhang and Yu, were sentenced 5 years and 3 years limited term imprisonment and fined 500,000 and 300,000 yuan in turn. The case began with consumers spotting hair in Daoxiangcun’s mooncakes and posting relevant pictures to 315, asking for protection in 2010. Then Beijing Daoxiangcun initiated an investigation which turned out that the case-involving mooncakes were phony. It’s estimated that Zhang had invested approximately 200,000 yuan to produce phony mooncakes. Trademark Appeal Board approved the registration of the “猛牛” trademark, which pronounces exactly the same with 蒙牛, a well-known dairy company in China. As a result, the 蒙牛 company was unsatisfied with the decision and sued the Board to revoke the registration of the “猛牛” trademark, which was unfortunately dismissed by the Beijing No. 1 Intermediate People’s Court in October 2012. According to reports, as early as in the trademark publication period of the “猛牛” mark, 蒙牛 company had raised objection. However, Trademark Office thought that the “猛牛” mark, which specified lubricant, had nothing to do with 蒙牛 company’s dairy commodities. As a result, the Trademark Office approved the registration of the “猛牛” trademark. Throughout July to November, the Third Patent Auction of China Technology Exchange (also known as the Second Patent Auction of the Institute of Computing Technology of the Chinese Academy of Science) attracted 232 inviting bids and made 87 subjects deals with a total turnover of 4,255,000 yuan. Furthermore, the turnover rate was more than 37%. It’s estimated that there were approximately 40 institutes from more than 10 regions making bids successfully with the highest single transaction reaching 2 million yuan. In November, China’s Ministry of Commerce pointed that the volume of China’s foreign-related trade secret infringing cases had been increasing year by year. To date, trade secret litigation has become another significant means to bring down Chinese companies, especially in SINO-US business environments. According to incomplete statistics, the volume of trade secret infringement and economic espionage cases launched by US enterprises against Chinese enterprises is increasing by approximately 10% per year, which is far beyond the growth rate of patent cases. Tongrentang, the first “well-known trademark” in China became the first to seek legal protection for “well-known trademark” through litigation in 2012. On November 15th, the right owner of the “Tongrentang” trademark Beijing Tongrentang took China Tongrentang to court. The controversy mainly lied in the competency of the defendant, whether or not “Tongrentang” is well-known and the grounds of the plaintiff’s compensation appeals. On December 6th in Brussel, EPO and SIPO formally started a cooperation program over a Chinese-English translation device. According to the agreement, an automatic translation system which enables on-the-fly translation from and to Chinese for English will be installed on the website of EPO, which will benefit both European and Chinese companies. The hottest TV-series Beijing love Story triggered a spat over its copyright. The Beijing Xicheng District People’s Court ruled in favor of Li Yaling, the plaintiff, who then won the case. Li Yaling brought a lawsuit against the defendant, Chen Sicheng, for his being in arrears in copyright royalties which resulted in infringement on a patent. And the court confirmed that Li Yaling and Chen Sicheng are co-copyright holders. Li Yaling was satisfied with the verdict and further indicated that she would thereby seek to invalidate Chen Sicheng’s contract to sell the copyright of Beijing love Story unilaterally. On February 16th, Sony announced that the transaction to acquire Sony Ericson’s 50% stake in Sony Ericsson Mobile Communications AB has been completed. This makes Sony Ericsson a wholly-owned subsidiary of Sony. Sony has renamed Sony Ericsson “Sony Mobile Communications”, and integrated the mobile phone business as a vital element of its electronics business. In March, 2012, the Copyright Board of Canada issued a price list of varying charges to places where copyrighted recordings are available for play. The provision went into effect on October 1st, 2012. A nonprofit association named “Re: Sound” manages the fee collection system, which then redistributes fees to musicians and record companies. Holding that environmental technologies can significantly contribute to worldwide efforts towards achieving a low-carbon economy, WIPO launched a program named “WIPO Green,” which facilitates the accelerated adaptation, adoption and deployment of these “green” technologies, particularly in developing countries and emerging economies. On April 13th, the gmail.de domain and the Gmail trademark were transferred to Google. Google’s e-mail troubles in Germany date back to 2005, when the company was forced to switch Gmail to Googlemail over a trademark dispute with venture capitalist Daniel Giersch. Prior to Google using the Gmail name, Giersch had acquired the G-Mail trademark for an electronic postal delivery business known as “Giersch mail.” After a protracted legal spat, Google was banned from using the Gmail name, and stuck with Googlemail. James Cameron, Director of 3D Titanic, is being sued by the Artists’ Right Society for violating the Copyright Law over the appearance of Picasso’s famous artistic work Awenon Maiden in the film. Reportedly, Cameron was sued for the same reason in 1997 when he shot the original film and he compensated by paying due royalties. As the 3D version of the movie was released, the Artists’ Right Society argues that Cameron should pay royalties again. Japan’s Parliament passed an amendment to its copyright law on June 20th. According to the newly amended copyright law, which came into effect on October 1st illegal downloaders will face a punishment of up to two years in prison or up to 2 million yen (approx. US$25,000) in fines. In addition, the practice of copying DVDs to a hard drive is also considered illegal. However, the operability of the revision is being questioned. Citizens claim the amendment infringes on their 1 privacy. The European Parliament has voted not to ratify the Anti-Counterfeiting Trade Agreement (ACTA), meaning the contentious copyright crackdown agreement cannot be enforced in the EU. On November 10th, Apple and HTC, in a joint statement, announced settlement of their patent disputes and agreed to a 10-year license of current and future patents. According to insider analysts, this settlement between Apple and HTC will bring restrictions to the development of Samsung. In December, Eastman Kodak Company’s proposed $525 million sale of its digital imaging patents to Intellectual Ventures and RPX Corp received a bankruptcy judge’s approval, bringing the photography innovator a step closer to exiting Chapter 11. Looking back at 2012, patent spats over intelligent terminals remained a hot issue throughout the whole year, with the controversy between Apple and Samsung attracting the most attention. It appears that the battle between the two giants will not be stopping any time soon, given that it has spread to the United States, Korea and Europe. China IP magazine will keep an eye on this dispute in the following year. In June, China IP magazine released the Report on the Patent Competitiveness Edge of Chinese Universities, which reflects the current patent competitiveness environment objectively. This report determined the index as the ratio of the number of patent licensing recordings in 2011 and the number of patent applications between 2005 and 2009. Anhui University, Nanjing Agriculture University, Hefei University of Technology, Xi’an Jiaotong University and Tianjin University took the lead inthis report. On June 12th, with the final verdict of the Wong Lo Kat case, China IP magazine hosted the Wong Lo Kat IP Issue Seminar to discuss issues concerning commercial bribery, the validity of contracts, copyrights, appearance patents, well-known commodity decorations, trade secrets, false promotion and arbitral procedures. Many famous judges and lawyers were invited tithe seminar and the event was widely praised. Authorized by Dutch-based Talpa Media Group, blind audition in TV show “Voice of China” has been copycatted by many TV programs in China. In August, China IP magazine invited insiders to discuss the patent protection of TV program formats. During the stirring discussion, experts set forth the current situation of international TV program format protection: many countries fail to enact relevant laws or decisions. However, the future of protection for TV program formats appears promising. An excellent patent translation can not only deliver technical information explicitly but also define the scope of patent protection accurately. As a result, the final patent application becomes much easier and applicants’ interests can be protected in a larger scale. While discussing the future of patent translations and enumerating translation practices, China I invited many patent translation experts to offer advice on how to translate accurately and correctly. 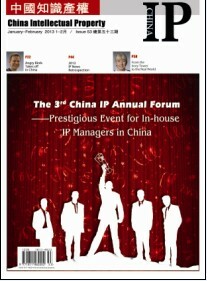 China IP magazine launched a project entitled “Survey on the Working Status of IP Managers in China” to help readers obtain a better understanding of the current working conditions, see the developmental future for IP managers in China, and to help I manager receive greater social recognition. The survey received 242 written feedbacks and interviews of 40 well-known I managers from August to December in 2012. Based on the above activities, the report on the survey has been successfully concluded. This event is the first of its kind in China. With the help of an Internet election and recommendations from IP institutes, China IP magazine selected 20 Outstanding In-house IP Managers on the basis of the Survey on the Working Status of IP Managers in China. The award-winners were presented at “The 3rd China IP magazine Annual Forum”. More information can be found in the Cover Story of this issue. From August to December 2012, China IP magazine and China Daily co-launched a project named “Survey on Global IP Service Agencies with Chinese Businesses”. The project comprehensively collected information about the scale, personnel, operation characteristics, marketing and the current situation of IP service agencies with Chinese businesses, and on which the recommendation of the agencies has been concluded. More information can be found in the Cover Story of this issue.